Vintage Engagement Rings - Shop the Largest Selection in SoCal! Watch & Wares has been the best place to purchase vintage engagement rings in Orange County for over 30 years. We have a huge selection of antique diamond rings from all eras. Because of our passion for all things exquisite, we offer only the best vintage rings. 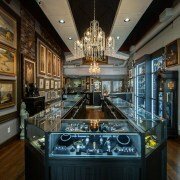 Due to our staggering inventory and top-notch customer service, Watch & Wares is the premier vintage engagement ring store in OC. Whether you’re looking for subtle or extravagant, we can find a perfect match! Many people who are getting engaged in Orange County start out confused. Vintage engagement rings can have a lot of quirks. It makes sense shopping for an engagement ring with experts by your side. Did you know that we stock vintage engagement rings from several different time periods? Because we realize you may not know what you love until you see it, it’s often best to stop into our large showroom and walk through the rings that fit your budget & taste. How Much Do Vintage Engagement Rings Cost? How much should you spend on a vintage engagement ring? The answer to that lies within your own budget and preference. While one of the perks of buying a vintage engagement ring is that you may see cost savings vs. buying new or contemporary, it all depends on your needs. We specialize in working with any taste and budget. Our passion has always been collecting. Therefore, when it comes to our selection, we’re not biased. Whether you’re the minimalist couple or want a peek at our high-end GIA Certified diamonds and gemstones, we’ve got you covered. Our specialty has always been the one-on-one service we provide our engagement ring customers. We know that spending a fortune on an antique diamond ring isn’t the key to happiness. Thus, we can help you choose the best vintage ring for your budget while making your bride-to-be extremely happy. Customization Options – Filigree, Engraving, Custom Settings, Using an Heirloom Stone, etc. How Does Watch & Wares Differ from Other Orange County Jewelry Stores that Sell Vintage Engagement Rings? 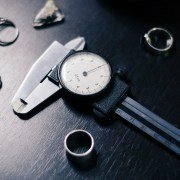 Because of all the options and so many vintage engagement rings from different periods, it’s often best to come in and speak with an engagement ring expert at Watch & Wares. 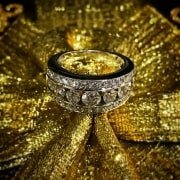 No doubt we’re different than other Orange County jewelry stores that sell vintage engagement rings. The first thing we’ll do is find out about you and your future bride’s taste. Next, we’ll talk about your budget and how much you’d like to spend on an engagement ring. Moreover, we’ll take our time understanding your needs and why you want certain features as well how important they are to you. Overall, your happiness should come second to none. Watch & Wares works hard to find you the right antique engagement ring at the right price, every time. 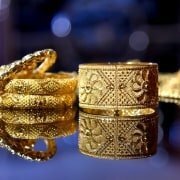 Furthermore, we won’t nickel and dime you like some jewelers, especially when it comes to the details. We offer a 12-month layaway on all vintage engagement rings at 0% interest! If you’re looking for a custom vintage engagement ring, we can build whatever you dream up! Whether you’ve seen a photo on the net and would like it cloned, or have a photograph of a family heirloom… our jeweler can knock it out of the park, and we’ve done so for hundreds of couples. A lot of engagement ring stores don’t have a GIA Certified Gemologist on-hand, but we do! Moreover, many of our vintage engagement rings feature GIA Certified diamonds and gemstones, fully-appraised. As a final note, when shopping for vintage engagement rings in Southern California, work with someone you trust. Take time to ask questions and see what their responses are. Furthermore, you should do your research on the net — read Yelp and Google reviews. You should find out if the jewelry store has been a fixture in the community for a long time. If they have an eBay or online store, check its feedback — know who you’re dealing with before you spend. At Watch & Wares, our reputation is number one. We know that you can buy a lot of things in life, but your reputation and name isn’t one of those. We’ve been a top seller on eBay since the mid-nineties (yes with dialup & AOL), and have a flawless 100% rating on eBay. We’ve also been selling from our brick & mortar locations in Old Towne Orange for over 30 years. Of course, our Etsy store is also thriving and receives excellent feedback weekly! 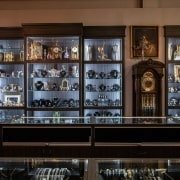 Likewise, if you’re looking to sell a vintage engagement ring or other estate jewelry, diamonds, fine watches, you can also visit our Tustin, CA location. We look forward to hearing from you, and hope that we can help you pick the perfect ring to propose with. If you’d like to send us a message with some details, fill out the handy contact form on our site. One of our Engagement Ring Concierges will reach out to you and find you something that fits your needs & budget!